Supreme Court nominee Neil Gorsuch is heading back to Capitol Hill today for a second day of confirmation hearings. 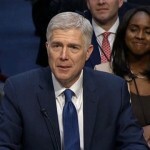 During Monday’s hearing, Democratic senators repeatedly criticized Gorsuch’s record, as well as their Republican counterparts for refusing to take up the nomination of President Obama’s pick, Merrick Garland, to replace the late Supreme Court Justice Antonin Scalia. All eyes are on the Supreme Court nomination of Neil Gorsuch, who is facing his second day of confirmation hearings. But Trump has 123 other federal judgeships to fill, because Senate Republicans blocked many of Obama’s nominees. We take a look at how a top official at the Federalist Society, named Leonard Leo, is playing a key role in helping Trump reshape the nation’s judicial landscape from behind the scene. FBI Director James Comey has confirmed the FBI is investigating whether Donald Trump’s campaign collaborated with Russia to sway the 2016 election. Comey also said the FBI has “no information” that supports Trump’s unsubstantiated claims that President Obama tapped Trump’s phones in Trump Tower during the election. The director of the National Security Agency, Michael Rogers, also refuted Trump’s claims that President Obama asked the British intelligence agency GCHQ to carry out the wiretap on Trump Tower.